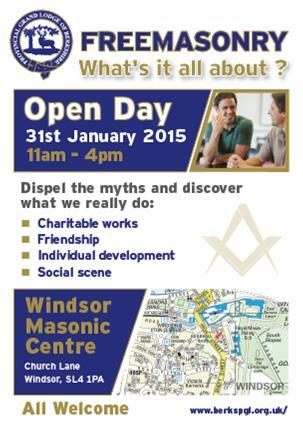 The Freemasons of Berkshire are throwing open their doors to the local community in Windsor at an Open Day on 31st January 2015. We want to give the public an opportunity find out what the Freemasons’ really do as opposed to the myths. We are offering the opportunity to tour this superb, spectacular, historical building right next door to Windsor Castle, and much, much more. We are extending a warm welcome to all to come and meet us – what have you got to lose? Just pop in anytime between 11am and 4pm on Saturday 31st January 2015. We are The Red Door at the top of Church St, Windsor, SL4 1PA. The last two days have been great. Yesterday I attended the consecration of a new lodge in Berkshire. A consecration is where a Lodge is made a Lodge and receives its warrant. The main lodge room at Sindlesham was full. It was a great ceremony to watch. The new lodge is called The Combined Services Lodge and is the first Military Lodge in Berkshire. It was great to see some adaptions to give the lodge a Military feel. The day ended with the Festive Board. This is the more relaxed side of Freemasonry, we have a nice meal, a good chat and a few laughs along the way. A few weeks ago I was invited to join a new recruitment team for Berkshire, today I attended the first meeting of the new team. There are 27 of us on the team and we are looking to expand the membership. It’s a really exciting project. One of our aims is to become a more open organisation. One of our concerns is that we have always been seen as a secretive organisation and one that was quite difficult to join. This is not the case, we welcome new members. So why become a Freemason? Everyone has their own reasons for joining. For me I enjoy both the work that is done in the Lodge and the very big social side of being a member. The lodge work is a bit like learning your lines in a show. I enjoy the challenge. Every job in the lodge requires you to learn lines for certain parts of what is traditionally called the ritual. At first I thought I would never be able to learn it all, I have actually been surprised at what I have been able to learn so far for the various jobs I have done. The social side of Freemasonry is great. After every meeting we have a meal and a drink in the bar. We have a good chat and plenty of laughs during the evening. I always leave thinking I can’t wait for the next meeting. As a Mason you can also visit other lodges, this is great! It gives you a chance to make new friends and watch how other lodges work. The old thing about Freemasonry is that you are in control of how much time you want to spend out at meetings. There are always meetings and event happening so you are never short of things to do. One side of Freemasonry that is never publicised is donations to charity. Lodges and provinces donate huge sums of money throughout the year, we also provide emergency donations in times of crisis. This is the main aim of our organisation and something we can be proud of. If this all sounds good get in touch with your local province, they will be very happy to welcome you. Our new recruitment team will be holding lots of open days at various Lodges throughout Berkshire, our next one is on the 31st January at the Masonic Lodge in Windsor. We will have displays and information packs available, we will be giving tours of the Lodge, you will be given a full talk on what we do in the lodge and what everything means in the lodge. You can also attend a presentation on Freemasonry by one of our team. Following the tour and presentation you can have some refreshments and a chat the team. Even if you don’t want to join you are most welcome to come and have a look around. See you there! !